ABOUT five krn off the one-time tourist spot, Kangan, on the S'rinagar-Leh highway etched out in one of Kashmir's several semi-denuded hills, there is hectic activity. Downhill, a platoon of the 11 th sector of the Indian Army's Rashtriya Rifles (RR) unit, armed with sub-machine guns and a rocket launcher, moves on. "We have been on a (combing) operation. Who let you in here? You could have got shot," snaps an irrate, young officer. The platoon hitchhikes to the base in a private truck reversed from its original route. Despite the Army's presence, another operation - a 'clandestine' one - goes on in fullswing. Pine logs from green hilltops roll down at a great speed - one every 15 minutes or so - spinning in mid-air, bumping against stumps burnt by village women in search of fuel. They fall into a foothill canal with a splash, float down to another village some 10 km down- stream where there are sawmills. A one-hour uphill trek would lead one to the spot of the second operation. In this pine forest, mature trees are chopped away with much precision. About 40 men are busy cutting, roping, felling and cleaning the logs. M Khan, assistant to a local timber smuggler who denies allegations about his alliance with Hizbul Mujahideen militants, states casually, "We havL- wiped off entire patches including those of walnut trees in this area. Nothing much is left." Perhaps they save their adrenalin for more risky situations. At the base camp the RR officer explains, "We have cleared this area of Hizbul Mujahideen militants." He waves a Maruti car carrying Kalashnikov-trotting renegade militants to halt. The car-borne gang - identified as the Taliban, backed by the Army - claims to have killed 40-odd Hizbul Mujahideen militants in counter-insurgency operations in the area recently. Chief wildlife warden, Jammu & Kashmir, S S Sharma, puts the situation pithily, "People are killed; who is bothered about forests?" In the menacing shadow of militancy, illegal logging has increased by leaps and bounds in several forest tracts in the valley. Former principal chief conservator of forest (PCCF), J&K, R K Mattoo, says, "Insurgency is responsible for the devastation. Vast tracts in Anantnag, Shopian and Sind forest divisions have been devastated." The extent is still unfathomed. Says present PCCF, J&K, M A Mufti, "We do not have the statistics since 1990. Our people can not even go to the field." Forest department statistics show Kashmir's forest area to be just 20,018 sq krn (barring Ladakh), that is, about 50 per cent. According to the J&K Directorate of Environment and Remote Sensing (DEARS),the state's actual forest cover is much less than what maps show. Says director Of DEARS, M A Kawosa, "Satellite imagery has shown that out of 20,018 sq km of forests, the actual cover is only 13,012 sq km." Thirty-five per cent of the total forest area remains degraded. Common sins Wood from forests from as far as Kupwara, essential for constructing elaborate Kashmiri houses, reaches Srinagar's parallel wood market. There is huge demand, and a hefty supply. The state's annual demand for domestic construction is a whopping 2.8 lakh cubic metres, reports the press. Often people resort to illegal logging as it is cheaper and quicker. In Srinagar one could find even well-to-do government employees resorting to "number-two wood" which has a thriving market. Mufti says, "Some fell trees for sustenance, some for profits. There have been cases of nexus between smugglers and paramilitary forces. Even the army has been involved in several cases." Ironically, militancy provides protection or an excuse for deforestation. Says an Army intelligence officer, "Entire forests have been destroyed by militants in Shopian. They simply cut trees and sell them for profits." Repeated attempts to obtain more precise information from the state Army HQ proved futile. "We have caught several cases. It is soft information, yet to be processed," says defence PRO, J&K, Squadron Leader S Hariharan. Some villagers say that the militants sometimes demand a cut. But there are no names. Obviously, to save one's skin, the allegations are directed only against the forest personnel. Also in Anantnag, a hotbed of militancy, villagers say that there has been rampant tree felling. But usually they prefer to keep mum about the people behind these deeds. Deforestation in the shadow of the gun is rather deep-rooted. Kashmir Times reported on October 13,1993, "Eruption of militant movement witnessed an ecological anarchy in the valley. Conservative estimates say that 100,000 trees were illegally felled in connivance with forest officials from the jungle peripheries of Arizal, Chrar Sharief, Shopian, Tral and Kupwara in the first two years of militancy... Official statistics reveal that over 3,407 ha are encroached yearly." Says Sq Ldr Hariharan, "There is cruel, large-scale destruction in the name of militancy. Militancy pays'." He informs, 'There are people who move around with the local militant leader and gain authority to cut trees in their strongholds." In K@iram, a stronghold of Hizbul Mujahideen, some villagers on condition of anonymity, admitted that Hizbul protects those who cut forests. However, Hizbul Mujahideen's local commander of Khiram-Sirhama, Zuhur Ahmed, denies the allegations and squarely blames the security forces. "It is their men who do it in civil dress. Then they blame it on us," says Zuhur. Also, there is widespread knowledge of renegade militants - surrendered or converted, forming counter- insurgency groups - indulging in deforestation. For instance, the Wular lake area, 34 km northwest of Srinagar, is under the strangle-hold of the counter-insurgency group Ikhwan-ul-Muslimoon. Reliable sources maintain that Ikhwan has assured local villagers free access to local forest tracts. "They fell trees even from the forest department's nursery in the area," says a source. This has earned the group leader Jamshed Shirazi - better knowihs Kukka Parrey - a Robin Hood image and the nickname 'Conservator'. Parrey's group, which boasts of killing separatist militants, has disclairned Army backing and denied a role in felling. There are similar allegations against Taliban, and other such groups. Tree felling and smuggling seems to be a sort of symbiotic process. People on the right and wrong side of the law are involved. For officials, there are sins of omission and commission. "The police these days is a quiet lot," says a smuggler's sidekick in Kangan. His logs reach downhill villages by roads or canals, are sliced into planks and trucked to Srinagar, crossing several checkposts manned by the police, paramilitary forces and the Army (every two km has at least one checkpost or picket). There is generous greasing of palms. "Sab khata hai (everybody accepts bribes)," says a Khan associate. Pine wood sold at Rs 80 per cubic ft at the foothill can fetch double,the price in Srinagar - still cheaper than legal timber costing Rs 230. Buyers in Srinagar say that contractors collect extra money from them in the name of militants, renegades, and even the checking personnel. Sadly, even the security forces are not without their share of mischiefs. Kashmir Times carried a report in October 1993 about local villagers accusing the Border Security Force (BSF) in Tragbal of felling deodars on Bandipora- Gurez road. The BSF didn't deny it. The Army itself has drawn flak for alleged involvement of some of their personnel in timber smuggling. The Srinagar-based Feature And News Agency reported: "The Army has 92,000 ha of forest area under its possession. According to DEARS, extensive damage has been done by the Army too, especially in the borders. Recently, they intended to prepare a detailed report on the ecological vandalism by armed forces, but were prevented by the authourities." About the Army's involvement the PCCF comments, "It was discussed at various high-level meetings, but hushed up." However, Hariharan brushes aside the allegations saying, "Nonsense." He informs that Northern Command in fact, has a mega-scale afforestation plan for the Himalayan region. The common refrain in officialdom is that, in this era of "gun culture", such things do happen. Sharma says, the only plus point of militancy has been a drop in legal or illegal game shooting by civilians, as carrying a gun became risky. Also, forest officials lament the fact that the people have lost their love for the forest which is seen as an easy target to loot. However, amidst widespread cynicism, there are shim- mering rays of optimism. In several villages, the locals have formed Jangal Bachao Committees. Assadullah Bhatt of such a committee in Khiram, a Hizbul Mujahideen stronghold, says, "For house construction, people have cut thousands of pine trees. Now we stop them." But the committee is helpless against organised crime. Says Bhatt, "We have stopped seven trucks so far. But many get away, as we can't function at night, which could be dangerous." G M Zargar, chief engineer, Urban Environment Engineering Department, also echoes the same observations. Despite government claims, chief wildlife warden S S Sharma says that there was rampant militant activity in Dachigam, home to the famous hangul deer. As militancy gained momentum spurring poaching and deforestation, the hangul population nosedived from 800 to around 110 between 1988 and 1992, according to the state Department of Wildlife Protection. The January 1995 statistics showed only 290 hanguls. Wular Lake, 34 km northwest of Srinagar and one of the six Indian Ramsar sites (wetland of international importance), has suffered a similar fate. "Had it not been for Wular, Kashmir would have been devastated Awl by floods," says Rashmi De Roy, wetlands programme coordinator, Worldwide 1Fund. for Nature-India (WWF). A 1994 WWF report said that "extensive deforestation" in the catchment area has "laid bare" surrounding hill slopes. Wular's catchment area bears the wounds inflicted by militancy. Earlier too, there has been deforestation and conversion of forests into paddy fields. As rivers are also silted and lake bodies are clogged, there are untimel@ floods in the Jhelum. Last year such unnatural floods in Nalla Sind wiped off the tourist park in Parang (Srinagar), and swept away a nearby bridge and a few houses. In 1986 too, there were major floods in the valley. Environmentalists have studied connections between floods and deforestation. Says Kawosa, "Forest snow melts in summer months and fills the rivers. If there is no forest cover, the total water release will reach the river within a month and lead to floods." April to July is the melting period. Explains commissioner (Indus), Union ministry of water resources, S S Sohani, "Snow deposit and its interception depends on the forest cover." For the past five years, no study in the Indus area could be conducted due to disturbances. Goodbye green forest Now rampant tree felling in Kashmir has become a trend which has become almost unstoppable. Its pace is unchecked and its extent under militancy is still undetermined. All along the history of Kashmir's forestry, there has been a trend of "local people's increasing indulgence", says Mufti. Kashmir's famed mosques and monuments carry hugeAft logs an@ranels of carved walnut and deodar. The membrial to the 15tti century poet-saint Sheikh Noor-ud-Din Noorani, of Chrar-e-Sharief shrine, which was burnt down by militants in May, was exclusively made of deodar. Ecologists say that the.40 wood came from deodar forests in the vicinity, of which not a qw@ trace is left now. Similarly, deodar from Gutelbagh and Ganderbal forest, 25 km off Srinagar served as a source for the" intricate wood Works of the lama Masjid of Srinagar. But the modern 'day assault, legal or illegal, has been out)" Tight callous. In 1992, the forest department issued a press statement saying that eight per cent of forests were encroached upon, and 160 encroachment cases are added yearly, taking the toll to about 14,000. Noticeably, over the years, people-forest interphase has been rather imbalanced in Kashmir. During 1988-89 alone, the Forest Department exploited 142 sq km of forests to meet the coptract of 4.49 lakh cubic metr@s of wood. As the forests dwindled, the official exploitation was cut down to 0.86 to 1. 14 lakh cu m a year, says Kawosa. But by 1990, there has been increased unaccounted fellings, say forest officials. Says Kawosa ruefully, "We removed wood thinking that the forest will regenerate. But it never regenerated. What we felled, we lost." 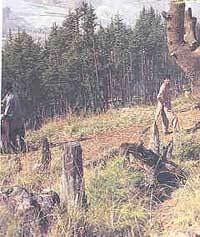 As per the "Dynamic forestry" policy, Zuhur Ahmed, a commercial felling was pro Mujahideen moted. Major trees take almost 125 years to mature. activist, squarely As large-scale fellings fed a blames the Army flourishing timber industry, officials overlooked the for ravaging the rotatory cycle. Later, poplar forests of the which takes 11 years to mature, became popular, Kashmir valley and now constitutes a large share of softwood industry. Also, social forestry programmes have absorbed the shock to some extent. The Eighth Plan envisages 64,000 ha under forestry and 74,00 ha under social forestry programmes. 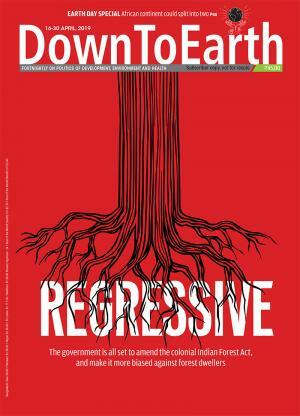 Eighty per cent of Kashmiris are forest-dependent. Wood has been a primary fuel for cooking and heating even in cities. "Srinagar, alone consumes five lakh quintals of fuelwood annually," says Mufti. Of an annual consumption of 179 lakh quintals of fuelwood, 118 lakh quintals come from forests. Till the 1970s, people seemingly had better and legal access to forests. Says Mattoo, "Local forest officials used to conduct timber distribution melas in each range. People in return prevented smuggling and illegal felling." But once the centralised forest acts were enforced, villagers gradually became hostile towards forest officials, as they felt that the timber alloted commercially through depots did'nt meet their needs. However, the officials do not fully subscribe to this view. Mufti points out that the pressure of grazing has also been responsible for forest degradation. "We tried to settle down Gujjars and Bakarwars, but failed. Now we coax them to cut down the flock and increase their productivity," he says. May be checks and balances are the only means for a sustainable monitoring of forest resources in a state where guntrotting goons spell the diktats, and citizens still await a solution from the inert administration.